Egypt is a reliable partner of Russia and Tatarstan. Business and cultural ties between countries and regions are being developed through governmental visits and business missions. 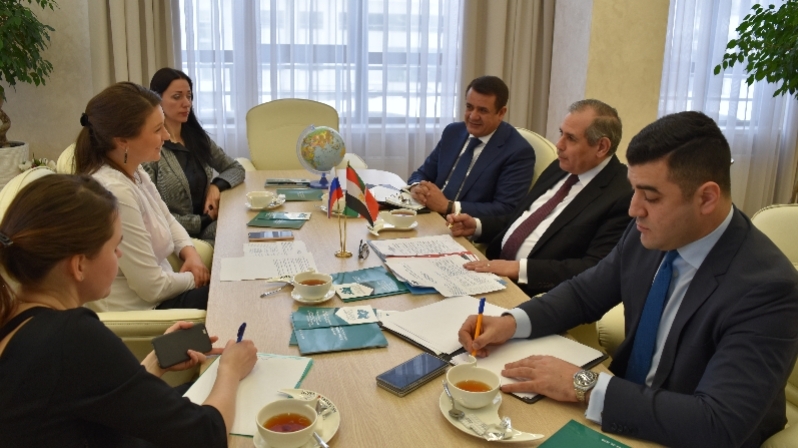 The work on increasing the export of Tatarstan’s products to the Egyptian market and exploring development prospects of mutual exports is underway. The participation of the Egyptian delegation with representatives of business circles in the business program of the International Economic Summit "Russia - Islamic World: KAZANSUMMIT", as well as the exhibition "Russia Halal Expo" held in the frames of summit, was discussed by the Head of Tatarstan Investment Development Agency Taliya Minullina and Ambassador Extraordinary and Plenipotentiary of the Arab Republic of Egypt to Russia Ihab Ahmed Talaat Nasr. The summit "Russia - Islamic World" will be held in the capital of Tatarstan on April 24-26 on the platform of the Exhibition Center "Kazan Expo". "Tatarstan is a Muslim region, which has been working actively on bringing Russia closer to Islamic countries for more than 10 years. We are very pleased that Egyptian governmental officials, representatives of financial institutions and business circles traditionally take part in the summit. Last year, for the first time and, it should be noted, successfully we held the Russian-Egyptian business forum in the frames of the summit. We are sure, this year in the frames of the forum we will be able to identify new platforms and projects for cooperation between our countries and regions," - Taliya Minullina commented. The topic "Halal" is a key one for Tatarstan, affects almost all the spheres of life and is one of the leading topics of the summit. "Halal is not just a designation of religious affiliation. Halal is a sign of quality. We created a roadmap for the development of Halal lifestyle, which affects Halal tourism, Halal production, fashion, finance, IT and media", - Taliya Minullina said. Ihab Ahmed Talaat Nasr, in his turn, expressed gratitude for the contribution of Tatarstan to the development of Russian-Egyptian relations, as well as the desire to take part in the summit events with the large delegation. For the first time, the International Economic Summit of Russia and countries - members of the Organization of Islamic Cooperation was held in 2009, creating a leading international platform for discussing cooperation and implementing joint projects, as well as presenting economic opportunities and investment potential. In 2018, the summit was attended by 3 000 people from 53 countries, 27 regions of Russia. For the second time, the summit hosted the International Halal Exhibition "Russia Halal Expo", which was attended by 72 exhibitors from 20 regions of Russia and 7 countries. Read more on https://kazansummit.ru/.